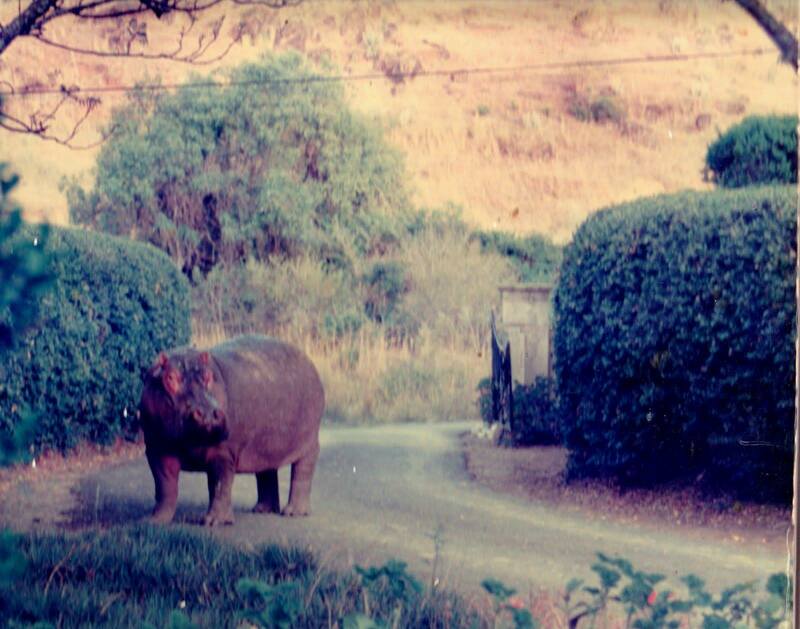 I grew up in the wilds of Kenya, still recognisable at the time from the films White Mischief and Out of Africa. 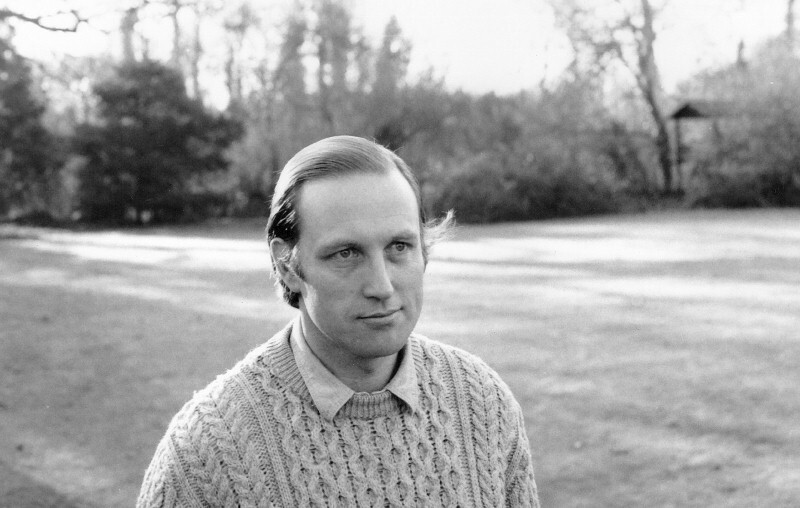 Lord Erroll’s last lover, played in the film by Greta Scacchi, was still around, having married Lord Delamere as her fourth husband. There were also a few very old people about who remembered Karen Blixen and Denys Finch-Hatton. They disliked her and thought him dull. Nobody could understand why Karen’s book was such a success, when all it did was record how everyone lived. My own family had come to Kenya because of my grandfather’s lungs. He was from the west of Ireland, but had been advised to emigrate somewhere warm and dry for his health. A keen foxhunting man, he chose Kenya because it had seven packs of hounds. My earliest Kenya memories are of my grandparents’ farmhouse at Limuru. The floor was carpeted with leopard and tiger skins shot by my great grandfather from the back of an elephant in India. You can’t do that any more. My father was a disappointment to his family: a weak and shiftless figure who never managed to make a go of anything – Mr Micawber to the life. Fathers like that are very common among writers. My mother was difficult too: a good-looking blonde, never knowingly well behaved. She was much younger than Lady Delamere, but they sized each other up at the Muthaiga Club in Nairobi and recognised kindred spirits (White Mischief was re-released as a DVD in 2011. I appear among the talking heads on the bonus feature, pointing out that most people in Kenya had nothing to do with the Happy Valley set). The stiffest upper lip in Africa. I promised myself on my first day at Pembroke House that no child of mine would ever go to boarding school. No child did. I loafed around until I was eight and then went to boarding school at Gilgil, in the Rift Valley. Pembroke House was an eccentric preparatory school, surrounded by electrified barbed wire to keep intruders out. Boys who ran away were hunted down with spearmen, tracker dogs and spotter planes from the Kenya Police airwing. 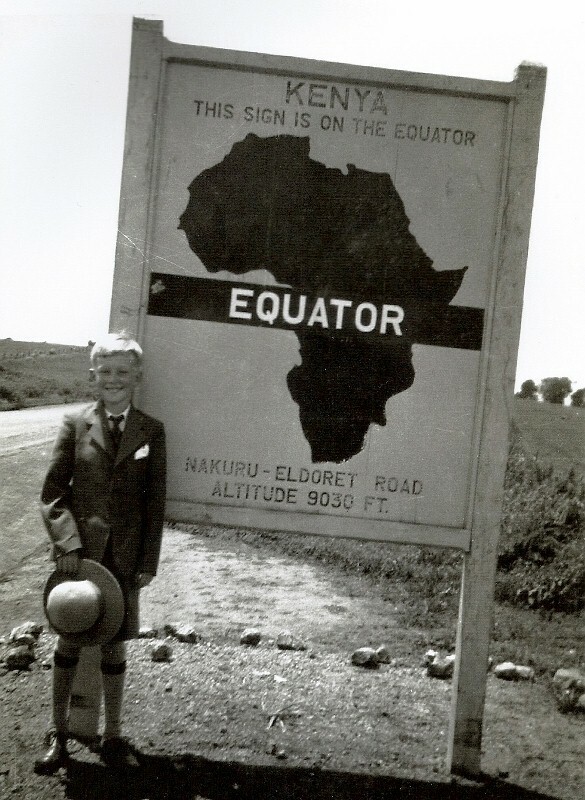 Two boys got away my first term and survived thirty six hours in the bush before recapture – an incident that featured later in my novel Tennis and the Masai. 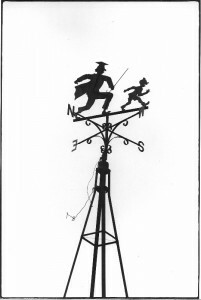 The school weather vane above the pigeon loft. Only the British could erect something like that in the middle of Africa and then organise pigeons to converge on it with the cricket score. Don’t get me started on the elephant ambling through the school grounds or the hippo that once came up the drive. With few telephone lines, communication was difficult. Lord Carbery, the former Prohibition bootlegger featured in White Mischief, once flew over the playing fields and dropped a message in a tin. The school kept a supply of carrier pigeons and took them to away matches, releasing them at intervals with the latest football or cricket score tied to their legs. The transport for away matches was an ancient Rolls-Royce, presented to the school by a parent in lieu of fees and converted into a bus. When I was a boy, I was determined never to be one of those pious-looking people who sit on the platform behind the headmaster while he addresses the school. 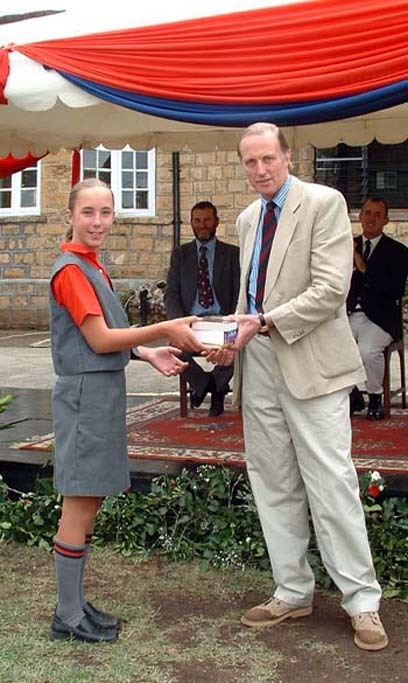 But a trip to Kenya to give away the prizes at my alma mater was too good to miss. Here, one winner of the school history prize passes the torch to another. I left for England at thirteen, sent away again to a public school like the one in the film If, right down to the same uniform. Like everybody from Kenya, I was horrified by England at first, appalled by the stuffiness and the negativity and the whingeing Poms. I was well taught at my English school, but I came away from it with a lifelong horror of authority or any form of group think. I was much happier at Trinity College, Dublin, where my grandfather had been a Scholar. He got a First in Classics and a gold medal, a feat combined with a three year sabbatical spent fighting Germans on the Western Front. I confined my own efforts to graduating. 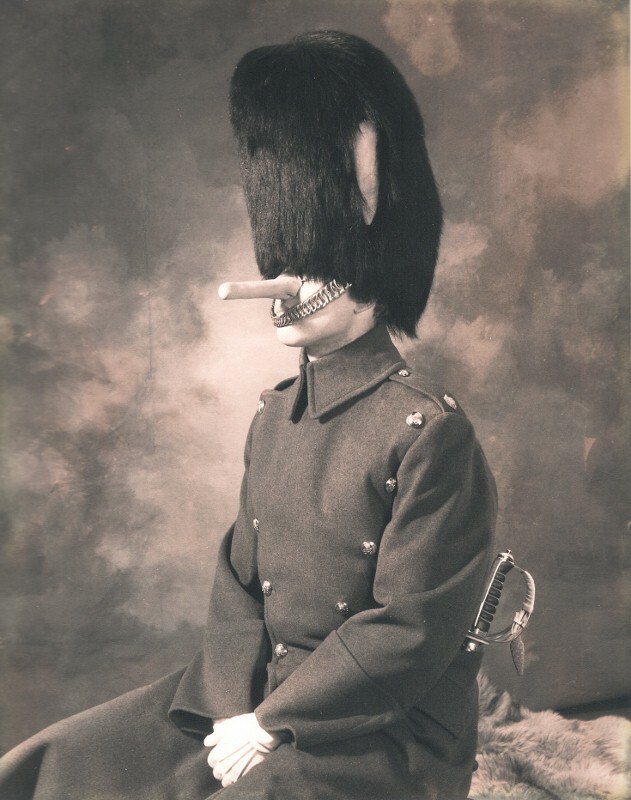 Thereafter, I served a spell in the Grenadier Guards, my father’s old regiment. I was sent straight to Belize, then still a British colony, in Central America. For political reasons, the ruling junta in neighbouring Guatemala had resurrected its claim to Belize and was threatening to invade along the only road between the two countries, which crossed a river near the frontier. The British government had despatched the Grenadiers and the Ark Royal in response. One of my brother officers bet me the equivalent of £10,000 in today’s money that I wouldn’t dare walk around Windsor Castle looking like this. At two a.m. on a foggy November night, it was only fear of bumping into Her Maj walking the dogs that stopped me. The story of the campaign is well told in Rowland White’s best-selling Phoenix Squadron. In an age of satellites and jet engines, the British were disconcerted to learn that the Guatemalans were about to attack with Sherman tanks and Mustang fighters from the Second World War. So unprepared were we that there wasn’t enough explosive available to be sure of destroying the bridge over the river at the frontier. A Grenadier sergeant therefore advanced on it with a spanner, proposing to loosen a few nuts and bolts before the Shermans appeared. Prior to the arrival of the Ark Royal, there was no air cover either. All we had was a private Cessna, owned by an elderly German who offered to fly along the border to see if anything was happening. He had been in the Luftwaffe during the war. And keep the bridge with me? I was a bit too imaginative for the army. When the Guatemalans failed to appear, I found alternative work as a journalist in London, sold my first short stories and became the fiction critic for the Financial Times. I went freelance when I got a commission for my first book, Happy Valley: the story of the English in Kenya, and wrote my first novel, Where were you at Waterloo? at Harvard, where my wife had a Fellowship. Since then, my books have all been written in a 17th century barn across the drive from my house near Cambridge. 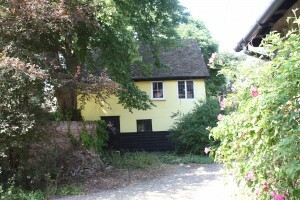 It’s in the same village where Macaulay once went to school. I enjoy writing popular history, preferably with a good plot so that the story can be written like a novel and paced like a thriller. The Greatest Day in History, my account of the 1918 Armistice, was a Waterstone’s recommendation of the month in 2008. In 2010, I was long-listed for the inaugural Sunday Times-EFG Bank award of £30,000, the biggest short story prize in the world. In 2012, my last book Five Days that shocked the World became a news story across the globe, courtesy of a two-page spread in the Daily Mail. Even the Himalayan Times covered the story, perhaps because the online illustrations included one of Audrey Hepburn looking very pretty (she escapes from a Wehrmacht brothel in the book) and another of Sophia Loren in her underwear. The book has since been a No 1 best seller on Amazon in four different categories. More recently, Thistle have been reissuing some of my early titles online. Happy Valley and Tennis and the Masai (serialized on BBC Radio 4 some years ago) have both been best-sellers in the Amazon Top 100 (Tennis and the Masai at No 3 in the humour category). My novella Point Lenana was released as a Kindle Single in May 2014 and became the No 1 short story best seller (literary fiction).